Particle accelerator technology has crested a new wave. For the first time, scientists have shown that electrons can gain energy by surfing waves kicked up by protons shot through plasma. In the future, the technique might help produce electron beams at higher energies than currently possible, in order to investigate the inner workings of subatomic particles. Standard particle accelerators rely on radiofrequency cavities, metallic chambers that create oscillating electromagnetic fields to push particles along. With the plasma wave demonstration, "we're trying to develop a new kind of accelerator technology," says physicist Allen Caldwell of the Max Planck Institute for Physics in Munich. Caldwell is a spokesperson of the AWAKE collaboration, which reported the results August 29 in Nature. 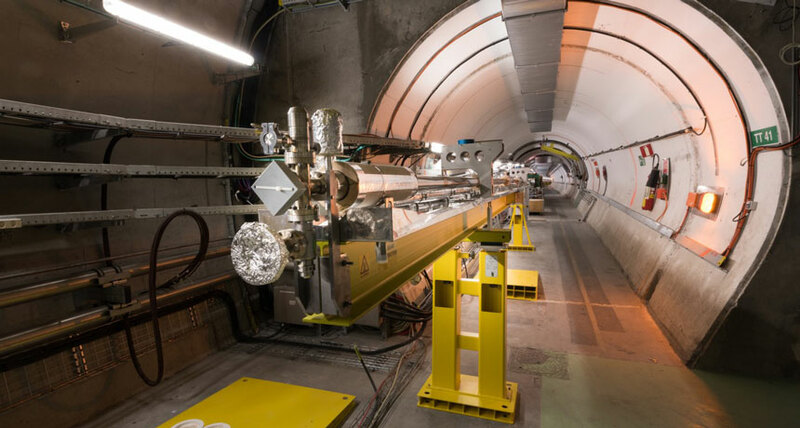 In an experiment at the particle physics lab CERN in Geneva, the researchers sent beams of high-energy protons through a plasma, a state of matter in which electrons and positively charged atoms called ions comingle. The protons set the plasma's electrons jiggling, creating waves that accelerated additional electrons injected into the plasma. In the study, the injected electrons reached energies of up to 2 billion electron volts over a distance of 10 meters. "It's a beautiful result and an important first step," says Mark Hogan, a physicist at SLAC National Accelerator Laboratory in Menlo Park, Calif., who studies plasma wave accelerators. Previously, scientists have demonstrated the potential of plasma accelerators by speeding up electrons using waves set off by a laser or by another beam of electrons, instead of protons (SN: 5/8/10, p. 28). But proton beams can carry more energy than laser or electron beams, so electrons accelerated by protons' plasma waves may be able to reach higher energies in a single burst of acceleration. The new result, however, doesn't yet match the energies produced in previous plasma accelerators. Instead, the study is just a first step, a proof of principle that shows that proton beams can be used in plasma wave accelerators. High-energy electrons are particularly useful for particle physics because they are elementary particles - they have no smaller constituents. Protons, on the other hand, are made up of a sea of quarks, resulting in messier collisions. And because each quark carries a small part of the proton's total energy, only a fraction of that energy goes into a collision. Electrons, however, put all their oomph into each smash-up. But electrons are hard to accelerate directly: If put in an accelerator ring, they rapidly bleed off energy as they circle, unlike protons. So AWAKE starts with accelerated protons, using them to get electrons up to speed. Prior to the experiment, there was skepticism over whether the plasma could be controlled well enough for an effort like AWAKE to work, says physicist Wim Leemans of Lawrence Berkeley National Laboratory in California, who works on laser plasma accelerators. "This is very rewarding to see that, yes, the plasma technology has advanced."